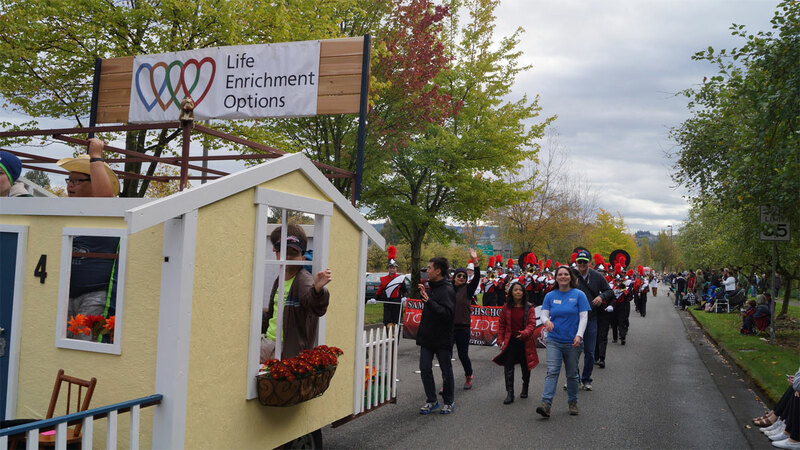 Life Enrichment Options (LEO) is a community based non-profit organization that advocates for and works to support individuals with developmental disabilities to achieve their goals through supportive housing, recreation, employment opportunities and community education. Our service area is the Issaquah and Snoqualmie Valley school districts. Life Enrichment Options (LEO) was born in 1988 out of the need of mothers of young adults with developmental disabilities. As their children were leaving the safety net of the Issaquah school district, there was very little to look forward to in the way of activities and services in the community. These women were determined that their children would live as “normal” a life as possible. They had a dream of employment, a social network with friends and independent living for their children. Over the years LEO has made significant progress in developing housing, programs and activities. Today, 30 years later, we remain dedicated to making their dream (and our dream) a reality. As the number of those with disabilities needing services increases, we will continue to be proactive in the areas which are vital to a quality of life for people with developmental disabilities. Partnered with Polygon Northwest Company to build the first adult family home for people with developmental disabilities in Issaquah. The Rose House opened in February 2003 for 5 individuals and a full time caregiver to call home. Purchased a home in Issaquah from King County, and opened the Ann House for five individuals with developmental disabilities and a caregiver in December 2006. Partnered again with Polygon Northwest to build our third home, the Angela House, in the Issaquah Highlands which was completed in May 2012. The house is now home to five residents with the support of a full time caregiver. All residents of each house now enjoy the independence that this housing model allows. All three homes have been accomplished with private funding. Sponsored speakers to inform those with developmental disabilities, parents, caregivers and educators how to seek creative solutions to problems facing people with developmental disabilities. Presentations included information on housing options, positive interactions with law enforcement officers, healthy lifestyles, and technology as a tool for independent living. Provided representation on the local parks and recreation special population’s recreation committee and in May 2014 began to offer our own recreational programs for those with disabilities. Held quarterly meetings of LEO outreach committees in Issaquah and the Snoqualmie Valley to keep our organization informed of the needs of the population we serve. Continued partnerships with the Issaquah, Sammamish, Snoqualmie Valley, Oak Harbor, South Valley (Spokane) Rotary clubs and the Richland Kiwanis to provide a fun day of gravity car racing in the Challenge Series Races for children with special needs. Recognized employers who employ persons with developmental disabilities in the greater Issaquah/Sammamish/Snoqualmie Valley areas, and encouraged the community to support their efforts. Our organization continues to grow as we stay connected with those involved with the lives of persons with developmental disabilities to keep current with their needs, and take action to meet those needs, as well as work with governmental agencies to provide innovative solutions to complex problems.